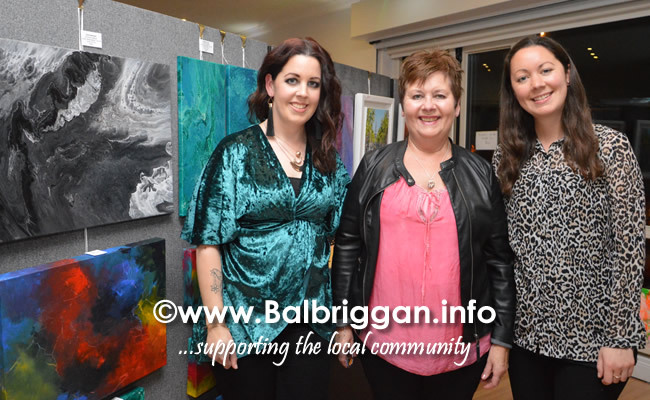 Balbriggan Golf Club held a Culture Evening with Music, Art & Photography on Saturday 29th Sept. 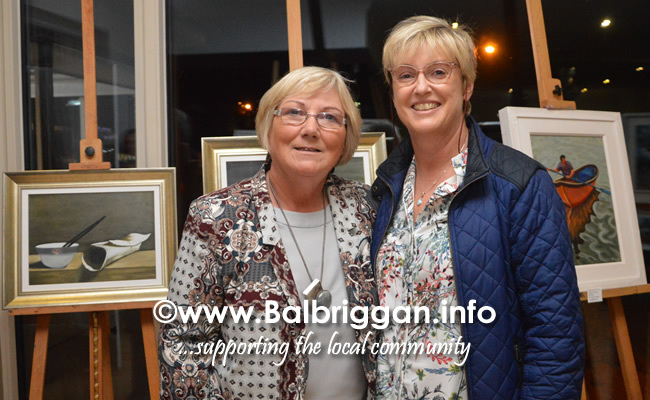 The idea for the Culture Evening came form our Lady Captain Beatrice Magee. 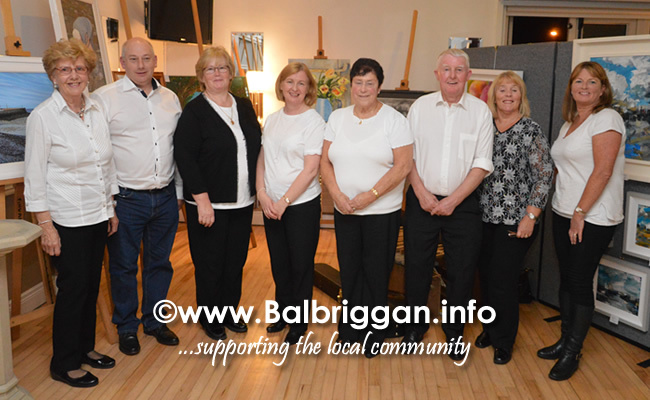 Balbriggan Golf Club & the Social Committee were helped by Balbriggan Library & Tom Reilly from Ardgillian Castle by supplying the boards & Easels for the Art & Photography work from our Club Members & Local Art Group. 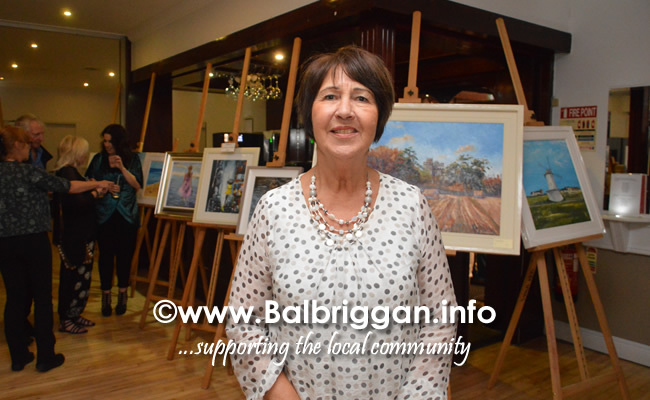 The clubhouse dining room was transformed into an amazing Art Gallery for the day. 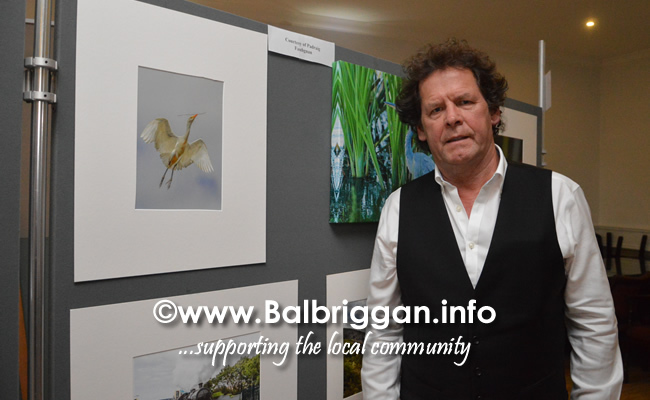 We would like to take this opportunity to thank all the artists & photographers for exhibiting their magnificent work. There were also some beautiful photographs courtesy of Joe Curtis that brought many members & visitors down Memory Lane with so much talk of “who’s who” in some of the photographs. 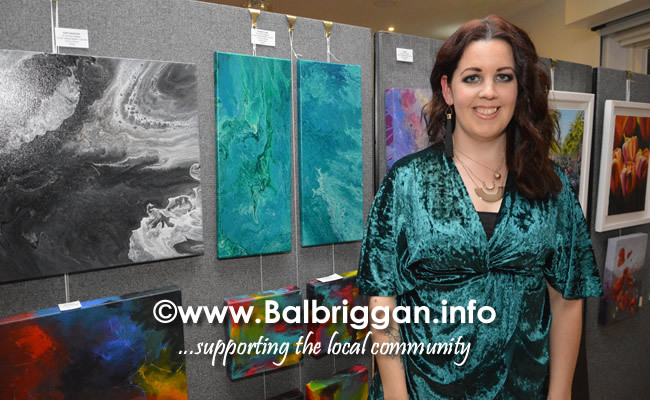 Evelyn Tolan & Padraig Faughnan also provided some fabulous prints & canvases that were admired by everyone throughout the day. 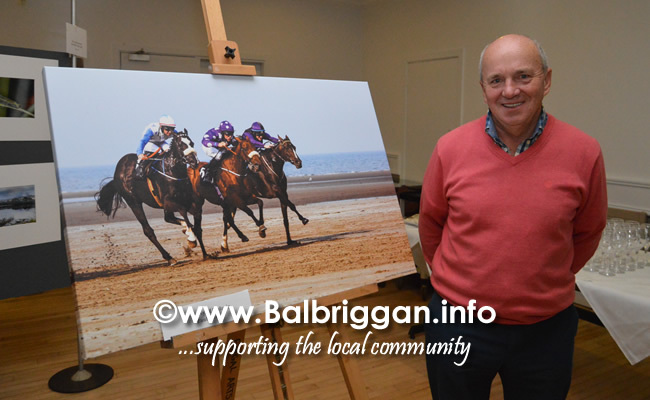 The evening entertainment began with an Historical Talk on Balbriggan by Hugh Cumisky. 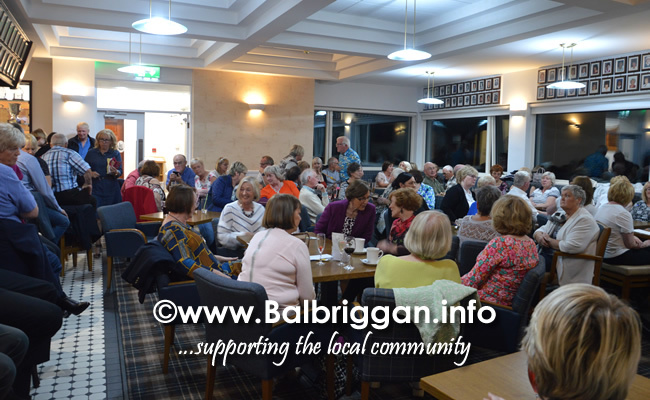 Hugh brought a very relaxed, much informed talk on Balbriggan to a packed clubhouse. 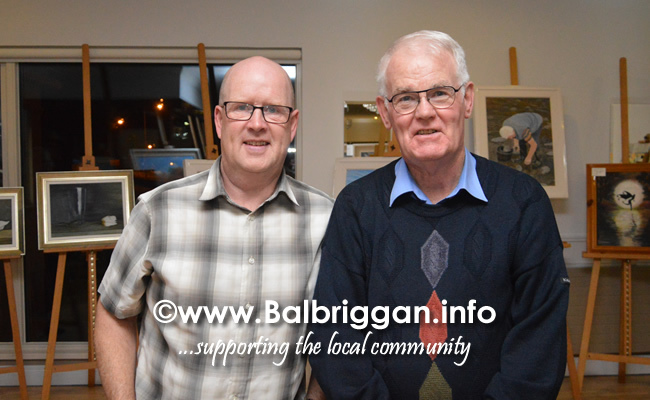 This was followed up by a Traditional Music Set from two of our fantastic Club Members Sean O’Connor & Brian Flynn. The Balscadden church choir that recently sang at Papal Mass entertained us with some Hymns & a medley of songs that had everyone joining in. 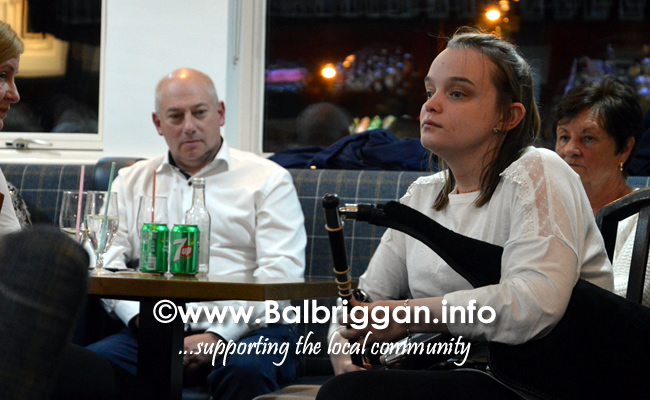 Christy Moore, Joe Byden & more recently Amy played at the very successful fleadh ceol in Drogheda. 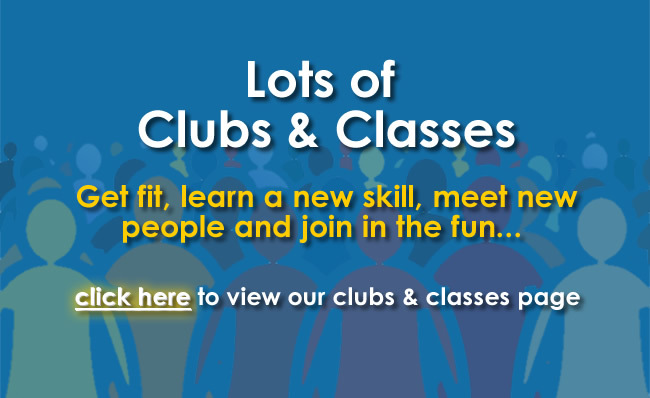 We wish Amy every success in the upcoming event in Vicker Street. Connie Morgan recited her own beautifully written poem penned in 2002. 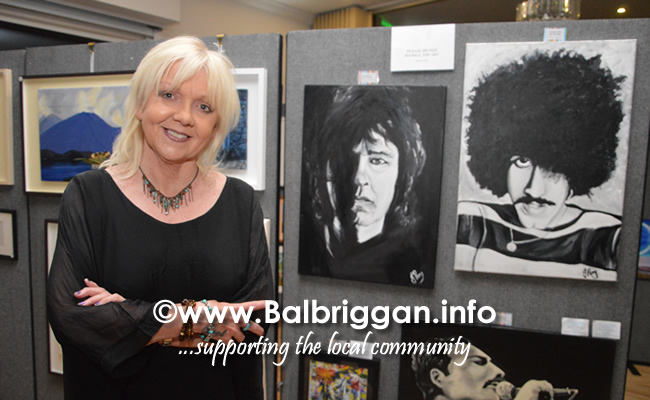 This was a very emotional piece that could also relate to today’s life about her childhood in Clonard Street. Next was the unbelievable Sean Kiernan. 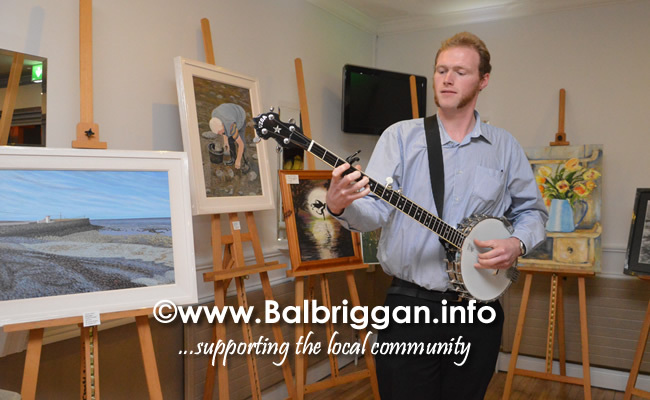 Sean teaches the tin whistle & is a brilliant bango player & singer. Seans tone is very similar in style to the late Luke Kelly. He had great ‘banter’ with the audience & there was no request he couldn’t play or sing. 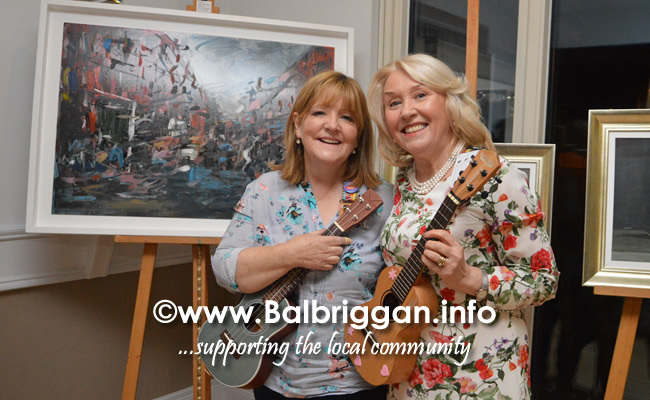 Theresa Murphy brought some friends along as well, the Skerries Ukulele Strummers. The group brought great musical fun & song as well as some stories from their front man that had everyone in great form. Our caterer Karl provided the cheese & fabulous wine during the short interval. 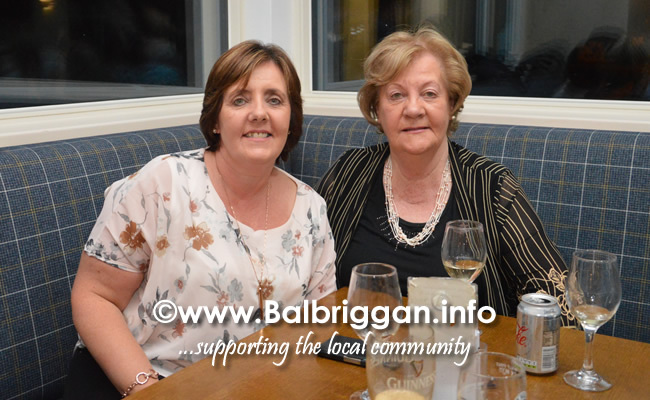 As well as an excellent menu Karl stocks a beautiful range of wines to accompany any dish at the Restaurant & Bar at very competitive prices..
Not many golf clubs are as lucky as Balbriggan Golf Club to have their own resident Poet. The genius of poetry & prose Tony Curtis, entertained everyone through his art of story telling, poetry & song. Tony called on his two assistants to help recite one of his poems. Sean McEvoy helped recite & Sean Kiernan to play tin whistle to add to the performance. Congratulations to Tony on recently winning the Laurence O’Shaughnessy Award for his most extraordinary contribution to Irish Literature from The University of Minnesota. Lady Captain Beatrice thanked everyone for coming & had a thoroughly enjoyable evening and also thanked the Social Committee for their hard work. After the Raffle Sean & Brian got the Open Mic session off to a flying start with some traditional tunes accompanied by Barry Kenna. This was followed by Jem & James Halligan mandolin & violin players. Eamon O’Brian sang a few numbers as did Mary Rogers. Jack Slaine quietly amazed everyone with his singing & guitar playing brilliance. 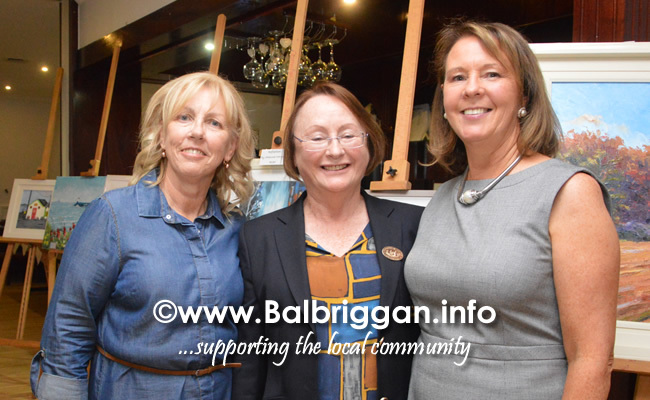 We would like to convey our thanks to Joe & Kim at Balbriggan.info & Fintan from The Fingal Independent for taking some photos to capture the night. 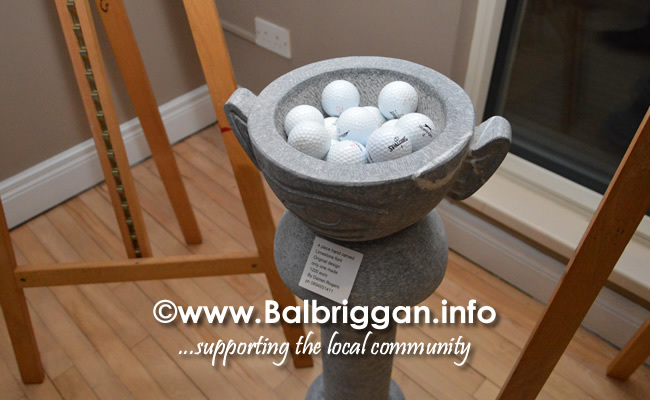 Huge thanks to everyone that helped or contributed to a really great day & night at Balbriggan Golf Club.